Hey, I’m sola. 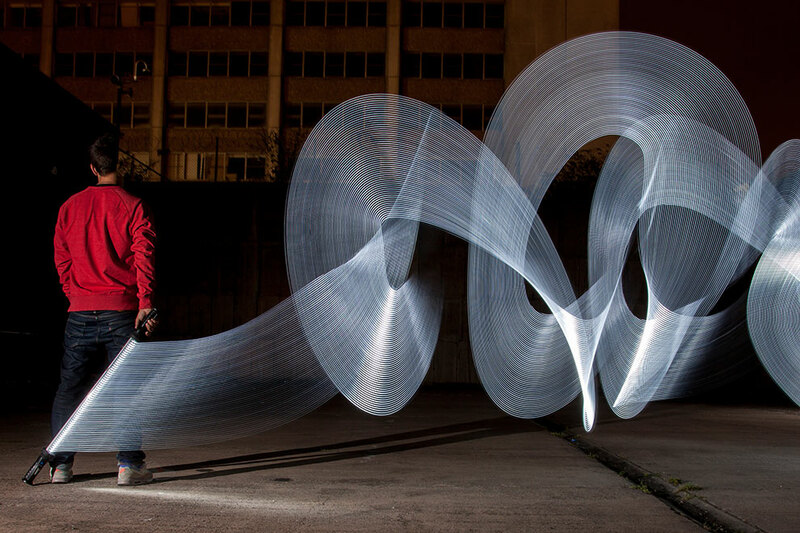 A light graffiti artist. I create light images using just the camera and a range of light sources. All of my images are real. What you see, is what I shoot. My work is featured in media (from international publications like Vanity Fair, European TV through to hundreds of blogs and newspapers etc) as well as collected and exhibited across the world. Mission statement: Make awesome images that inspire both myself and you, the viewer. …well, thank you very much to the media. It’s nice to know my efforts are appreciated. I get a lot of questions about my work, me, my process etc so I wanted to get this all down here in one place. I’m kinda old school. I grew up with film cameras and Darkrooms (and spent most of my education in them). I can’t paint. I wish I could. But I’m a photographer (have been since I was around 8 years old) and I’ve always had the inner calling to create. For a long while, I did this through skate and snowboarding and, as a pro photographer making images of the sports, bands and lifestyles that I knew and loved. But, after a while, I wanted more. I wanted to be in control of the whole image making process. Then I found light painting. Quite by accident one night while shooting landscapes of the urban environment and instantly I knew it was what I’d been looking for. I like to keep things real. I shoot with digital cameras, yes, but I employ the principles of analogue film technology – in that once I’ve made an image I don’t change it any more than I could in a darkroom and therefore what you see, is what I shoot. I believe there’s a real magic to creating something wonderous that’s ‘real’. Sure, there’s a place for post production in this world but on the whole, you won’t find any here. To the point that even if I am caught in the scene then the image is thrown away. I aim to create images that allow the viewer to suspend their reality and simply enjoy the energy and mystery of the image. For me, this is my craft. // How do I make my images? Typically, it takes between five and ten frames to create the image I am looking for – but often the first frame is the one. But either way, when it’s right I stop. When I work it’s like being in a zen state. It’s just me, the location and the light form that I’m trying to put down. The camera is often the only observer, capturing the ephemeral moments for all to see. The real art happens there and then: Me bringing the light form into life as a sculpture of solid light. - A headspace like no other: Pure focus. - I’m nurturing and encouraging the light form until it becomes what it needs to become. - Creating something that has never been done before (and through virtue of the process can never truly be repeated). …honestly, you should try it. It’s good for the soul! // What’s the process of making these images? It’s no big secret. In a nut shell, all you need is a camera, a tripod, a light source …and a bag of ideas. While the camera exposes the scene over a period of 30 seconds or so. I move my lights in front of the camera creating the light form or sculpture. Every light acts like a painters brush: leaving different marks upon the camera sensor. Every movement creates a different texture or intensity of light. For me, everything should happen within the camera. there and then. With a background in fine art I’m often asked, and often inclined, to add an ‘artist statement’ here. It’s true that my work is often rooted in concept or a principle I’m exploring. But you know what, do I really need to explain the concepts in great depth? My working practices and intended outcomes? Do you really want to know that I work with light as my raw material and intend to exploit and manipulate its properties to install a state of wonder and awe in the viewer? My point is; is there anything wrong with simply enjoying an image? Should we all have art history degrees to understand work in a gallery? I want to create something new. Make something that has never happened before. I want to allow the viewer to suspend their reality and just ENJOY, BE EXCITED and INSPIRED …even if it’s just for a moment. I know that I tick the first two boxes and by exploring the site and galleries yourself, I hope that you will tick the last box. The individual project pages under ‘Portfolio’ for each set of images will explain more about why the images were born in the first place. …but remember, it’s perfectly cool if you simply just like the images.